Want to protect your aftermarket wheels from being stolen? The answer is locking lug nuts! 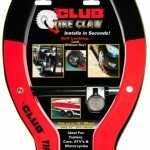 These special wheel locks will help keep your wheels safe even in dangerous neighborhoods or unlit parking lots. You’ll sleep better at night knowing your new wheels will still be on your car when you wake up in the morning. Without a unique key, thieves will be stopped in their tracks if they attempt to steal your rims. 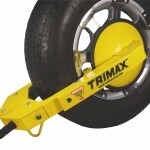 Want to know what wheel locks will give you the best security at the lowest price? See my reviews below. Editor’s Note: Use the table below to find the correct locking lug nuts for your car or truck. Not sure which to choose? Follow links to check vehicle fit on Amazon. Why do you need anti-theft lug nuts? I don’t have to tell you that your wheels are expensive to replace. You already know that. But, what you may not realize is that thieves are not only after your rims but also after your tires. It’s not just low profile tires that are fetching a premium on the black market. If you own run-flat, SUV or offroad truck tires, you may be a target as well. Why is it impossible to find wheel and tire theft statistics? 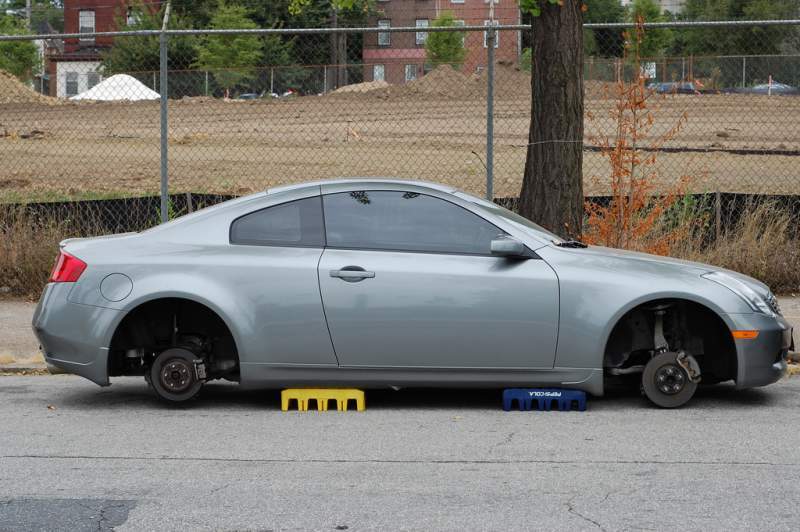 Because it’s almost impossible for police to track down stolen wheels. If your tires are stolen there’s very little chance that you’ll get them back. Once they hit the black market they can be sold online in minutes for a premium. In fact, in many cases these crimes don’t even get reported to the police or insurance companies. Most are left scratching their heads as to how they became a victim. The reason these crimes are on the rise again is because it’s easier than ever to make a profit by selling aftermarket parts online. Without wheel locks, you may find your tires for sale online too. How Do Wheel Locks Work? 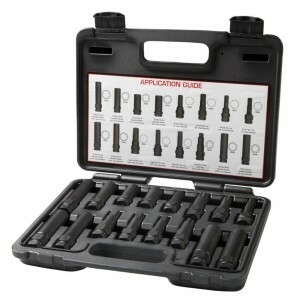 A standard set of wheel locks come with 4 or 5 lug nuts and a special removal tool. These nuts will look different than your original lug nuts. 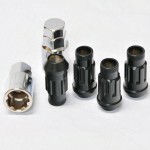 They are a special shape, usually larger than normal wheel nuts, to prevent a standard socket from fitting on the nut. Instead you need to use the special key to remove the nuts from your wheels. You will replace one lug nut on each wheel with the new locking nut. Keep your spare lug nuts in a safe place in case you purchase new wheels later down the road. Although thieves will be able to remove 4 of your 5 total lug nuts, they will not be able to take your wheel and tire without removing the last nut. If you are feeling overly protective of your new wheels (who isn’t?) you should order 4 sets of wheel locks. That way you can replace all of your lug nuts with ones that need a special key to be removed. Not necessary, but highly recommended. Remember to put your wheel lock key in a safe and secure place. While it may be tempting to keep it in your glove box, I would advise against it. If a thief breaks into your car they will have access to your special lug nut key and can remove your wheels in minutes. Preferably, you should hide it in the trunk, under your seats, or in a special compartment. I should also point out that you should not leave your special key at home either. 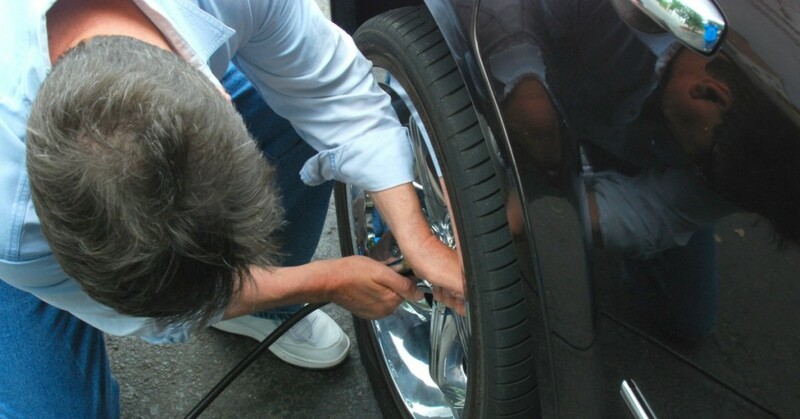 In the event you get a flat tire, you or a roadside assistant will need the key to put on the spare tire. Without the key you will be stuck on the side of the road until you can find a creative way to remove the lock. Trust me it’s not easy and in some cases it can be very expensive. If you’re shopping around for wheel locks you’ll immediately notice that there are only a few brands on the market. The most popular brands include Gorilla, McGard and Muteki. Each brand has a lot to offer and as you’ll see below they all offer different styles, colors and proprietary locking systems. 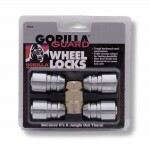 Gorilla Automotive Products is the leading brand in the wheel lock industry. They have been in business for 35 years and there’s a reason so many people purchase Gorilla lug nuts – because they work! With headquarters in Los Angeles, CA they have access to technology and talent that has helped them produce high performance products. Not to mention, they can put their products up to the test on some of the most dangerous streets on the west coast. The new Gorilla Guard Wheel locks provide extra protection to those that need it most. 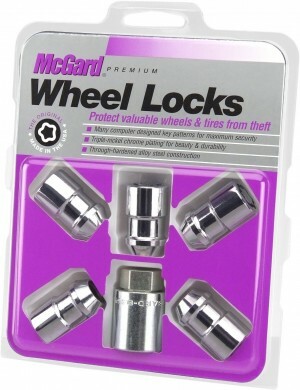 These locking lug nuts feature a free-spinning sleeve to prevent thieves from by passing the security key pattern found on standard locks. 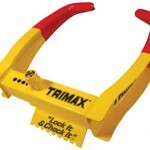 According to the product website, the locks are designed with the narrowest groove possible for added security. All Gorilla lug nuts are manufactured with case-hardened steel and chrome plated for that showroom look. McGard has a long history in the wheel lock business. They opened their doors in 1959 and in 1960 the founder, Lewis D. McCauley, designed and patented a security nut to prevent the theft of car tires and wheels. Today, they are an international company that produces anti-theft devices for auto, marine and even municipal applications. While they offer a wide range of products, their most popular lug nuts are available in shank, cone seat and bolt style versions. 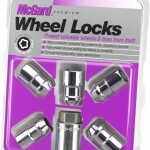 McGard wheel locks are unique because they have a protected, internal locking pattern to prevent tampering. With exterior lock patterns, persistent thieves can find a way to adapt a standard socket to the nut. With McGard you don’t have to worry about this. It’s no wonder that so many people put their trust in these wheel locks. Muteki is a Japanese parts brand with a long-standing reputation of producing high-quality parts. One of their most popular lug nuts is the SR48. This is an open-ended lug nut with a knurled end for better grip and a cool look. These lugs are designed to give you race performance with car show looks. A perfect combination in my book. All Muteki lugs are manufactured using cold forged chrome vanadium metal, so they can handle almost anything you throw at them on the street or strip. You’ll also notice that they are designed with an oversized 60 degree cone seat that gives better contact on your wheels. 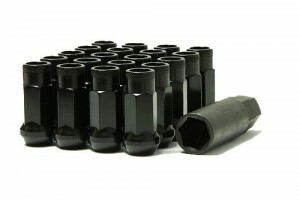 One of the unique advantages of Muteki lug nuts is that they come in a wide range of colors. They are currently available in titanium, burned blue, pink, chrome neon, red, blue, and black. The only way to remove lug nut locks from your wheels is with the special key that comes with the set. It’s that simple. While you may find videos on YouTube showing you how to buy pass old wheel locks, these methods no longer work. That’s good news if you are looking to buy a new set of locking lug nuts – not such good news if you lost your key. The majority of ways shown online to remove lock nuts is to use a large socket and brute force to break them free. You’ll notice that most brands like McGard and the Gorilla Guard lug nuts have an internal nut pattern that prevents any potential security breaches. If you lose your special key, you’ll need to order a new one from the manufacturer. In order to get the right key, you’ll need the special key number that came with your wheel lock set. Without this code, the manufacturer with have a very difficult time sending you a new key. This key number tells them this size of your lug nuts and the pattern on the end. As would be expected, patterns and configurations have changed over time to prevent thieves from getting past these wheel locks. I can’t emphasize enough how important it is to keep your wheel lock key in a safe and secure place. Eventually, you will need to use it again. Whether you get a flat, buy new tires or wheels – you need the key to remove the lug nuts. Even though you can easily order a new one from the manufacturer, it can takes days if not weeks to get one delivered to your door. Not a fun prospect if your car is stuck on the side of the road with a flat tire.